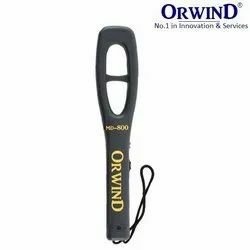 ORWIND SecureWand-V9000Hand-Held Metal Detector, Plastic ABS With RubberGrip Single Zone Portable Metal DetectorKey Features: A product of a reputable brand“ORWIND” | Popular and reliable portable metal detector| Precise and handy | Perfect for quick search | Poweredby 9V battery – work time up to 110 Continuous hours. |The most important feature of the detector is its highsensitivity, allowing to scan at optimal distance, e.g.detecting a pistol from 25 cm, knife – 15 cm, razor blade –7.5cm. If there are any objects in the vicinity which maycause interference with the device's functioning, it isrecommended to lower the sensitivity of the detector. Bypressing just one button we can eliminate the interferencecaused by other metal items and perform a reliable scan.When a metal object is detected, a sound alarm,vibrations or red LED light is triggered. Additionally, oncethe device is turned on, the diode lights green and turnsyellow when the battery is low. 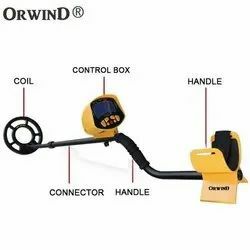 ORWIND GMD-500 UndergroundMetal Detector Gold Digger Treasure Hunter ProfessionalDetecting Equipment Pinpointer LCD DisplayDescription: The UG-9004 includes exclusive Target ID technology andAmazing features. This technology features two indicator scales that allow youto see the detector's discrimination setting (Lower Scale) as well as the analysisof each detected target (Upper Scale). The UG-9004 also features EnhancedIron Resolution (additional resolution for separating desirable targets from ironjunk in cluttered areas) and a standard 8.5" Ã— 11" elliptical Double-D searchcoil engineered for optimum performance in more challe- nging mineralizedsoils. 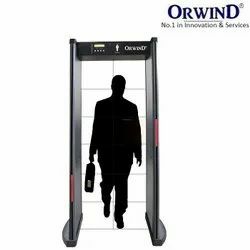 Your UG-9004 metal detector is the most advanced of its kind in theindustry. Whether you are experienced or a beginner, this machine is wellsuited for a wide variety of your detecting environments. 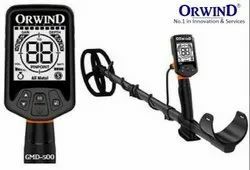 With One-Touchoperation, the UG-9004 powers on with the touch of a single button, adjustseasily for ground minerals and is immediately ready to begin searching.Thesearch coil is waterproof.